revel in Carlos Brathwaite’s belligerent grace by paul hayward – mark jacobs lives! Telegraph: Root’s 54 after a poor start by England in a score of 155 for nine put just enough pressure on the West Indies to create the possibility of a barnburning finish. England must have thought a second chance had dropped from the gods. But there is no legislating in Twenty20, or in life, for the kind of grace under pressure Brathwaite laid before our eyes. His first six sent a shiver of trepidation through England. The second was a punch in the guts. 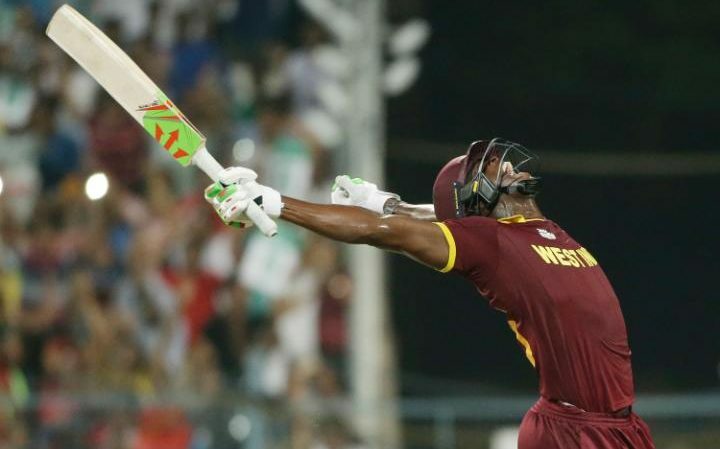 The third rendered a West Indies victory inevitable. The fourth was entirely unnecessary, since Brathwaite’s team needed only one more run to win. By then there was no halting his exuberance. Who is to say that if Stokes had bowled the last two balls, Brathwaite would not have sent them into the stands too? One day England may reflect that they were simply on the wrong end of freakish human nerve. For now they will think this was a terrible way to lose. It was actually a very good way, because they were destroyed by brilliance: a quality to which they aspire.